Why is it so important to have the right colors in your home? 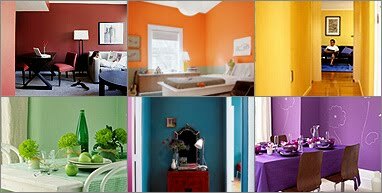 Because the colors in your home, no matter what room they are in, affect people in different ways and give people a certain view of who you are as a person. Our reaction to color is immediate and has an unfathomable impact on the choices we make. What we are talking about here, of course, is Color Psychology, which is the study of color as a factor in human behavior. All humans react to colors in slightly different ways, and that is because we all have different experiences and different outlooks on life. Generally, although the exact emotion associated with the color may be different, colors have the same basic connotative value. When one hears somebody say “red,” the normal thought may be of caution or love. Red could denote a stop sign, a fire truck, or maybe something red in your past that had some kind of negative feeling with it. Red can also mean love for some, making the person feel loved, excited, or even really happy. Red is inherently exciting and the amount of red is directly related to the level of energy perceived. Red draws attention and an ardent use of red as an accent can immediately focus attention on a particular element. The color gray, though, does not have so much passion associated with it. Gray is the color of intellect, knowledge, and wisdom. It is a color that is decorous, conservative, and holds power. Gray is a great neutral, which is why interior designers often use it as a background color. Blue, on the other hand, is more of a balance between the two. Blue can be both calm and exciting. Blue is seen as dependable and steadfast, and as the collective color of the spirit, it invokes rest and can cause the body to produce chemicals that are calming. Not all blues are serene and sedate, though. Brilliant or radiant blues become vibrant and dramatic and are an engaging color that expresses liveliness, while some shades of blue may come across as cold or callous. All colors, not only these ones, have different emotions and thoughts associated with them, and all of these things should be taken into account before you go through with decorating any room. At J. Douglas Design we are happy to help you choose whatever colors you need and we will happily make suggestions for color & textures to maximize use of your space based on your vision.